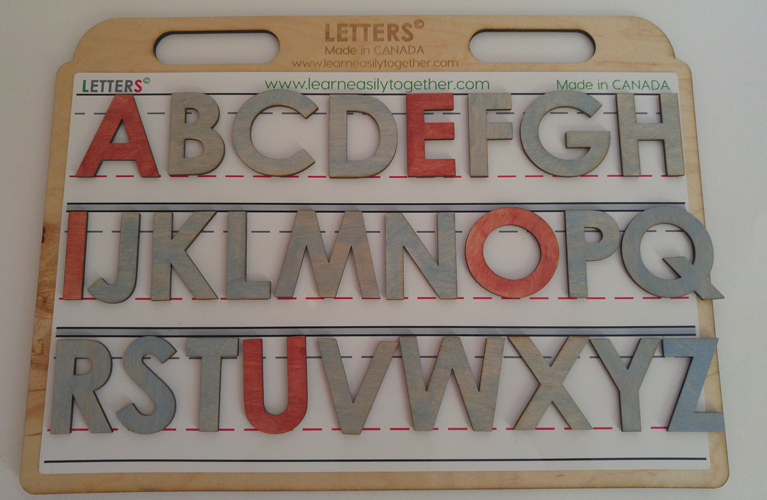 Each of the LETTERS© Kits can be used alone or with other LETTERS© Curriculum and Resources. ​This set complements teaching calendar skills. LETTERS© Anticipation Calendar Kit Set give opportunities for students to discover the benefits of a calendar and how to use one. In order for the LETTERS© Anticipation Calendar Kits to be meaningful to each student add items to personalize each day’s kit. Learning Outcomes: sequencing of days; names of the days of the week; each cell of a calendar represents a day; each row represents a week; each column represents all of the Sundays (or Mondays, or Tuesdays etc.) in the month; the basics of a chart (cell, row, column). Learning Extension: sequencing of dates, months, years; knowledge of months and seasons; understanding time – the days in a year, the days in a week, the hours in a day, the minutes in an hour, the seconds in a minute; the effects of the sun, moon, and stars on time and seasons; the reasons for and the benefit of using a paper-based or technological calendar. The LETTERS© Left to Right Expansion Pack Kit is designed to complement the lessons covered in LETTERS© Left to Right Expansion Pack. The kit uses play and discovery to focus on the concepts of self-awareness and the reading/writing direction of left to right. Learning Outcomes: Self-awareness; dominant hand, ear, eye, and foot; left and right sides of people, animals, and objects. Learning Extension: English written language is read from left to right. The LETTERS© Alphabet Discovery Kit is designed to complement the lessons covered in LETTERS© Module 1 Curriculum 1.1 and to be used in conjunction with the LETTERS© Printing House Expansion Pack Kit. This kit uses play and discovery to match each alphabet letter’s initial sound with the beginning letter sound of an object. The object, used as an icon for each letter of the alphabet, matches with the hand-drawn images in the LETTERS© Module 1 Alphabet. Learning Outcomes: Discovery of each letter, the name of the letter, the main sound of the letter, and an object to associate with the letter sound as shown in LETTERS© Module 1 Curriculum 1.1. Learning Extension: Every word must have at least one vowel; vowels and consonants combine to form words. Made in Canada with only the finest quality wood. Stain and clear coat are non-toxic. ​These puzzle boards are an outstanding educational resource for learners of all ages. ​consist of two (2) puzzle boards with twenty-six letters per board. 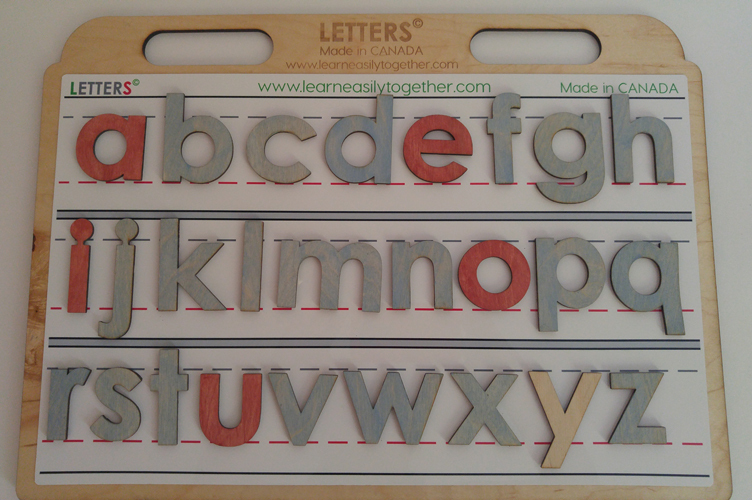 * LETTERS© Uppercase and Lowercase Puzzle Boards are shown together for display purposes only. 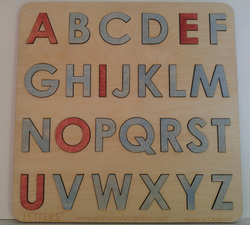 The LETTERS© Puzzle Boards are also sold separately. The LETTERS© Uppercase and Lowercase Puzzle Boards are designed to complement the lessons covered in LETTERS© Module 1 Curriculum & Kits. These boards use play and discovery to match each alphabet letter into it's space in the uppercase or lowercase puzzle board. Learners will also enjoy matching each uppercase letter to its lowercase form. 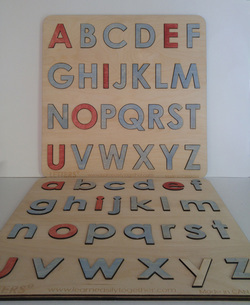 Students use play and discovery with these wooden puzzles to learn the letters of the alphabet and to recognize vowels (red) and consonants (blue). Learning Outcomes: Discovery of each letter, the name of the letter, the uppercase and lowercase form of each letter, matching the uppercase letter to its lowercase form. ﻿Learning Extension: Each letter has a sound; each letter is either a vowel or a consonant; 'y' is a vowel and a consonant; vowels and consonants combine to form words. Made in Canada with only the finest quality wood. ​The LETTERS© Dry-Erase Magnet Board is designed to complement the paper-based lessons covered in LETTERS© Module 1 and is used in combination with LETTERS© The Printing House Expansion Pack. This magnet board is made of coated steel and is usable with dry-erase markers and magnets. The LETTERS© Dry-Erase Magnet Board is best used with LETTERS© Magnetic Uppercase and Lowercase Letters. This board can also be combined with LETTERS© The Printing House Animals to get the most benefit from LETTERS© The Printing House Printing Guide Lines. ﻿Learning Outcomes: Recognizing each letter, the name of the letter, and the main sound of the letter; practice forming letters with dry-erase markers in LETTERS© The Printing House Printing Guide Lines. ​Learning Extensions: Every word must have at least one vowel; vowels and consonants combine to form words. * LETTERS© Dry-Erase Magnet Board sold separately. LETTERS© Dry-Erase Magnet Board and LETTERS© Magnetic Alphabet are shown together for display purposes only. ​LETTERS© Magnetic Uppercase and Lowercase Letters are designed to complement the paper-based lessons covered in LETTERS© Module 1 and are used in combination with LETTERS© The Printing House Expansion Pack. 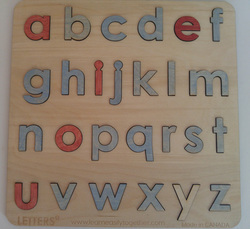 Students use play and discovery with these magnetic letters to learn the letters of the alphabet and to recognize vowels (red) and consonants (blue). LETTERS© Magnetic Uppercase and Lowercase Letters are best used in combination with the LETTERS© Dry-Erase Magnet Board. Use the following LETTERS© products with these magnets Uppercase and Lowercase Puzzle Boards, The Printing House Animals, and Uppercase and Lowercase Letter Tiles. ​Learning Outcomes: Discovery of each letter: its name and the main sound of the letter. Made in Canada with only the finest quality wood. Clear coat is non-toxic. * LETTERS© Dry-Erase Magnet Board sold separately. LETTERS© Dry-Erase Magnet Board and LETTERS© Sentence Pack are shown together for display purposes only. LETTERS© Sentence Pack is the perfect addition for teaching the Four (4) Types of Sentences. Lesson 17 in LETTERS© Symbols to Sounds Educator's Guide provides opportunities to discover three (3) types of punctuation and how to use them; question mark, exclamation point, and the period. The comma and apostrophe are discovered in LETTERS© ​Module 1 Curriculum 1.2. Learning Outcomes: Punctuation marks are symbols which indicate what type of sentence is being read or written. Discovery of punctuation marks and how to use them in the Four (4) Types of Sentences. Every sentence must have punctuation to provide understanding and to avoid confusion. Learning Extensions: There are many types of punctuation. C.O.P.S. will be introduced in LETTERS© ​Module 1 Curriculum 1.2. LETTERS© Letter Roads are a terrific solution for those students who are having difficulty with letter formation. The large letters are available in Line Art (black and white) for those who would enjoy colouring the roads and In Colour (vib) for those who want to get started with the fun right away. Each book includes the uppercase and lowercase version of all twenty-six (26) letters. The toy car is also included. ﻿The 1 -Inch guide lines in this practice book bring consistency to the Printing House Guide Lines students enjoy using in LETTERS© Module 1 Curriculum. Special orders are welcome. Order books with guide lines in other sizes such as, 0.75 -Inch, 1.5 -Inch, or 2 -Inch. ﻿﻿The 1 -Inch guide lines in this Notebook bring consistency to the Printing House Guide Lines students enjoy using in LETTERS© Module 1 Curriculum. The white space at the top of the page is perfect for budding artists. LETTERS© Dry-Erase Sheet Protector is the perfect solution for any age of learner.